Relocate your home in with the least hassle possible. Call for a free service quote today. We will help you get your deposit back from your old landlord by turning your old place to mint condition. Easily dispose of any domestic or business waste you want cleared before the moving day or after the relocation. 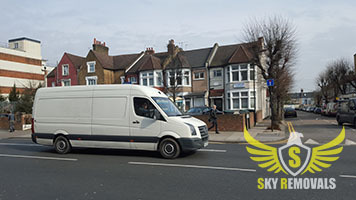 Sky Removals is a top-choice for a moving company in London for people from all over the area. The comprehensive list of moving services combined with the serious professional attitude with which we are handling every single job we have been hired to do make us a leading London based removals company. What you can count on us for is a variety of services related to removals in London. Our team of licensed and extensively experienced technicians handles domestic and commercial relocation jobs alike, which means you can count on us for domestic relocations as well as for commercial moving such as office removals in London. We move entire properties with ease and care for the detail. The methods we employ have been tested numerous times on the field and are guaranteed to deliver optimal results with minimal hassle, stress and waste of resources. Naturally, our premium quality equipment and vehicles have much to do with this. We have access to the latest packing and loading tools that are employed in the industry. Our fleet consists of mid-sized and small vans, as well as large trucks that are ready to accommodate even the largest domestic or commercial moving project you might be having trouble with. Safety gear such as moving blankets (cleaned after every job), belts, ropes, trolleys etc. The drivers on our team are veterans in the industry. They know every corner of the capital, so removals in London with us are always done on the safest and quickest route possible. Thanks to the special fuel saving driving techniques we employ, both carbon emissions and the costs of the service are significantly lowered, which benefits us all. At Sky Removals we care greatly for your comfort and peace of mind throughout the duration of your moving day. This is why we have made sure to guarantee by having us work by your side you have access to all the assistance you might need in relation to your removal in London. We offer basic waste clearance and moving out cleaning (end of tenancy cleaning) services. Our skillful movers in London would be more than happy to give you a helping hand with packing your goods, or at least provide you with the necessary high quality packing supplies so that you can do the job on your own. Get the wrapping and removal boxes you need on a reduced price from us. If you need to put away some of your goods for a while, we will arrange the storage for you in clean, well secured premises with no minimal contract period. The reason so many people choose us for their removals in London is the perfect blend between efficiency and affordable prices that we offer. This is made possible by the years of hard work and experience we have put into tailoring our methods, but also because of the unique custom removal quote calculator we have created in order to estimate the individual costs of every project we have been approached for handling. We are ready to send a skillful member of our team for a viewing and better consideration of the situation if that is deemed necessary and we are going to present you with the final price before you have decided to hire us. When you are worried about whether your fragile and very pricey goods will reach their assigned destination intact, just call Sky Removals and we will do what needs to be done. We put extra care in handling expensive items and use specially tailored methods and specialised equipment and supplies in order to do the job properly. Full CMR insurance will of course be added to your quote for your own peace of mind. 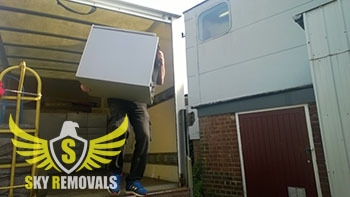 Our top quality moving services are available throughout London. Our nation’s capital is among the largest cities in the world, with a population of well over eight and a half million people. The River Thames is one of the most recognizable natural features of London – it floats straight though the heart of the city. The territory of the capital is divided into 32 boroughs. Every single one of them has its unique traits and character. London is a popular tourist destination, and there is no way around it – Buckingham Palace, The London Eye, Westminster Abbey are all major attractions here. London is among other things a very important commercial centre. The City and the recently redeveloped district of Canary Wharf in Tower Hamlets are the two places where most of the big firms and corporations are based. Tourism and Entertainment are among the big industries in London, but for sure not the biggest. Cosy residential areas can be found both to the south and the north of the River Thames.